SATURDAY, SEPT. 22: Peace and love were out in full force last night at the John Lennon tribute concert. The musical icon, whose career spanned three decades, would surely have been proud of the little island that inspired his last ever album Double Fantasy. It’s only fitting that the show took place in the same gardens that inspired him some 20 years ago when he visited the island with his son Sean, and the fact that it was on International Peace Day was just the cherry on the cake. The sold-out show was a huge success as some 27 local and international musicians paid tribute to the iconic singer/songwriter. Everything was performed live and Bermuda’s artists gave it everything they had. The Botanical Gardens proved to be the perfect spot for a concert of this magnitude and hopefully it will set a precedent for years to come. Bermudian gospel singer Kassandra Caines, granddaughter of Lois Browne Evans, stole the show with her electrifying rendition of Lennon’s moody Losing You which earned the first standing ovation of the evening. Not only was her voice fantastic but she had a vibrant, almost theatrical stage presence and bounds of energy and personality. This local singer clearly has the passion and talent to make it big in the music industry - she is certainly one to watch. Maxi Priest surprised us by performing a number of songs but his jazzed up version of All My Loving was an absolute show-stopper. The reggae/R&B star may be 51 but he still has the verve and energy of a youthful performer. As guests arrived at the concert the Bermuda School of Music string orchestra performed instrumentals by The Beatles including Yellow Submarine, Blackbird, Lucy In The Sky With Diamonds and Hey Jude. After a short intermission of recorded Beatles and Lennon songs the show opened, on time, with the brilliant Rachel Brown who sang a sultry version of Watching The Wheels from the album Double Fantasy. Her husky voice was soothing and very reminiscent of the late Amy Winehouse. The crowd loved her and it was a great way to kick off an evening of outstanding entertainment. Performances that stood out included local singer Phil Morrison whose crazed version of Lucy In The Sky With Diamonds was packed with raw energy. The Beatles were known for their enjoyment of recreational drugs and this version of a song, already associated with acid (LSD), certainly sounded like it was composed on another planet. It was also accompanied by the psychedelic cartoon made famous from The Yellow Submarine film. While the remaining Beatles could not make it to the show, we were treated to performances by Roy Young, the man who turned down an offer from Brian Epstein to join the legendary band to pursue his own musical career. Young’s rock inspired covers, including the energy packed I Couldn’t Dance With Another, got everybody up on the dance floor. Horrendous Mendez were accompanied by Graham Foster – the sculptor who designed the John Lennon Sculpture that is now at the Botanical Gardens at the entrance to Masterworks. It was a hilarious performance of Gimme Some Truth, packed with attitude and very much in the spirit of John Lennon. Foster told us off stage that it was his “first and last” musical performance, which is a shame as he had great presence. The entertaining and ever satirical MC Bruce Barritt said afterwards that the song could make a good campaign song for either the PLP or the OBA. Another memorable performance was made by Jonathan Frith who sang a beautiful version of Lennon’s Beautiful Boy. It was very true to the original and it was nice to see a performer who actually looked like Lennon. He was later accompanied by his cousins Christina Frith and Heather Nova who sang harmonies as they did when they were growing up together. It was a nice touch when they put on round glasses and fake Lennon beards and toasted John Lennon who, they said, “had the best seat in the house”. Yet another Frith – Julia – sang the song Julia with her mother Christina and her harmonies were beautiful. To finish off the “Von Friths”, Daniel Frith (aka Uzimon) took to the stage with Maxi Priest later in the evening for a hilarious performance. The Tzuke family were also out in force and Judie’s daughters Bailey and Tallulah have certainly inherited their mother’s talent. Judie’s version of Love was heartfelt and captured Lennon’s vulnerability. Bermuda’s own Heather Nova also did a rendition of Norwegian Wood which, while it sounded a little high pitched, was ably performed. The evening also included some ensembles including the Chewstick Foundation’s Power To The People and All You Need is Love by numerous local singers including Tourism Minister Wayne Furbert, town crier Ed Christopher and the characterful Ronnie Lopes. 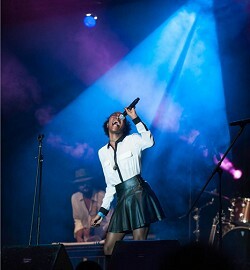 It was good to see Mia Chambray back on the Bermuda stage even if it was a one off. She was her usual bolshie, bouncy self as she sang Don’t Let Me Down. She has huge stage presence and, as always, she had lots of interaction with her musicians. It’s a shame the mic failed for Joy Barnum’s backing singing for the first half of the song. On the whole the sound was great if a little quiet at the very start of the concert. The big screens worked excellently showing live footage of the performances, still shots of the musicians as well as psychedelic animations and music videos. I doubt a concert of this magnitude could have been possible without the corporate sponsors and hats off to them for their support. Having said that it was extremely jarring having to watch adverts on the big screens at a John Lennon concert on International Peace Day between performances. They were only a few but it wasn’t in the spirit of the concert - Lennon himself might have raised an eyebrow. Perhaps if this event takes place in years to come the sponsors can have VIP areas around the edge of the field and perhaps some branding placed elsewhere but not on the big screens. It was interesting to see the film by the Blue Halo Project highlighting the move to make Bermuda’s waters a marine protected area. The concert could have worked well as an all standing event as people were itching to dance – as it was VIP seating took up the front section followed by another section of seats and the standing crowd at the back and up on the banks to the sides. The evening was jam packed with performances and there could have been more intermissions so people could chat and take a break. This concert celebrated the life and works of John Lennon as well as International Peace Day and it was fitting that proceeds went to charities The Coalition for the Protection of Children and the Masterworks Foundation. The evening ran smoothly and on time, the weather was perfect. Organizer Tony Brannon should be commended for pulling off such a tremendous show. Thanks to his excellent contacts in the music industry and his vision and passion for entertainment, we were treated to a show, the likes of which are rarely seen on this island. Want to be in Will Black's music video?